Set in the future in a post-apocolipitc world, Katniss Everdeen and Peeta Mellark, along with 22 other children between the ages of 12 and 18 are thrown into an arena where they are forced to fight to the death. “The Hunger Games” is suspenseful and can be violent and gruesome at times. It also, however, contains a love story that draws in the females who are not already hooked. There is not a single person, male or female, that I’ve talked to who has read the books and not fallen in love with the trillogy. Although it is classified as a young adult book and technically my friends and I are no longer included in that category of literature, “The Hunger Games” has managed to capture our imaginations in a rare way. Not surprisingly, Hollywood caught onto this craze early in the game (pun intended 😉 )and “The Hunger Games” movie is coming out in late March. With Jennifer Lawrence, Josh Hutcherson and Liam Hemsworth in the leading roles, the movie is sure to be just as awesome as the books. So, in your spare time I highly recommend heading to the book store, or whatever online site your tablet connects to, and purchasing “The Hunger Games.” They are an easy read and I promise you will not regret it! 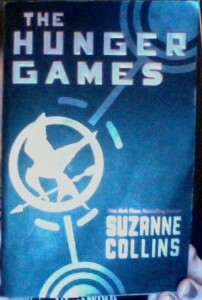 My copy of "The Hunger Games"